A company had severe shock and leakage problems on a piece of mobile equipment. The pump was also being changed at intervals of once per month. There was an adjustment on the pump (called a compensator), which limited the maximum system pressure. A relief valve in the system was used as an extreme safety device and a shock absorber. The recommended settings for the compensator and relief valve were 1,500 and 1,750 pounds per square inch (PSI), respectively. When the stacker started and stopped, the pressure gauge needle spiked to the maximum of 3,000 PSI, vibrated and then settled in at 1,800 PSI. This indicated that the compensator and relief valve were both set too high. After the compensator and relief valve were reset to the recommended settings, the pressure went up momentarily to 1,750 PSI (relief setting) before settling in at 1,500 PSI (compensator setting). The difference in the force exerted on the 10-inch boom cylinder (78.54 square inches of area) with the relief valve at 3,000 PSI and at 1,750 PSI was 98,175 pounds. Once the pressures were properly set, the shock was eliminated and the life of the pump was increased. After the clamps and O-rings were replaced, the leakage stopped as well. 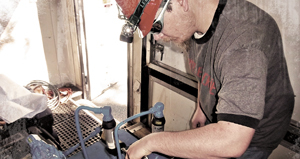 When a machine is repaired, the pump’s electric drive motor is turned off and lockout/tagout procedures are performed. 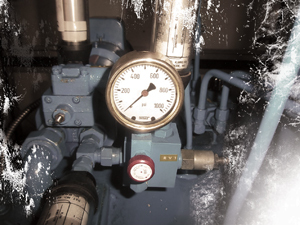 The pressure gauge is rarely checked before work is begun on or around the machine. Accumulators store hydraulic energy in the form of pressurized fluid. Most systems contain an automatic or manual dump valve that will allow the high-pressure fluid in the accumulator to dump to the tank, permitting the pressure to drop to zero. The automatic dump valves can fail closed, which will maintain the pressurized oil in the accumulator. If a line is taken off or a component removed, an individual can become injected with high-pressure fluid. When a manual dump valve is used, the human factor enters the equation. At one plant, a young millwright was severely injured when he was injected with high-pressure oil after he failed to open the hand valve. There was no procedure in place for opening the valve before working on the system. Many times the gauge is located on the pump side of the check valve and not the accumulator side. When the pump is turned off, the gauge will drop to zero as the oil bleeds to the tank through the hydraulic pump’s internal tolerances. The maintenance person or operator thinks the pressure is at zero and has no way of knowing if the pressurized fluid in the accumulator has been released. On systems of this design, a gauge should be installed at or near the accumulator. permitting the pressure to drop to zero. When a hydraulic problem occurs, information must be gathered to determine which component is causing the problem. A few examples include checking the pump case drain flow or checking for heat in the system. Many times the supervisor intervenes and demands that the pump, cylinder or other component be changed. At one plant, a supervisor instructed a millwright not to troubleshoot but to manually actuate a directional valve. This resulted in an accumulator discharging into a partially filled 5,000-gallon reservoir. The top of the reservoir blew off, which shut down the mill for seven days. Hydraulic schematics are usually located inside the machine manufacturer’s manual, which is often kept in a maintenance office or storeroom. When a hydraulic problem occurs, the last thing the maintenance person wants to do is to take 15 or 20 minutes to find the manual. After all, when a machine is down, time is money. A better option is to mount larger schematics by the system under a Plexiglas cover. Smaller prints can be laminated and similarly located. If the schematic is readily available, it will be used. The most common statement I hear from mechanics and electricians when consulting with a plant on a problem is, “I don’t know much about hydraulics.” This means they either have not been trained properly or have forgotten what they have learned. 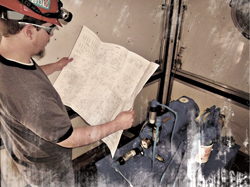 On the other hand, when I visit plants where machinery-specific hydraulic training has been conducted, I normally hear, “We use manuals and schematics all the time.” Without the proper training, you cannot expect your maintenance crew to troubleshoot effectively. While most plants do a good job of maintaining system filters, the reservoir usually is not given any attention. When a system is designed, the reservoir size is factored into the amount of heat that will be removed from the system. Reservoirs should be cleaned a minimum of once a year to allow some of the heat in the oil to be released to the atmosphere. On a log-loader in Ontario, the reservoir had not been drained or cleaned in 17 years. A thick layer of sludge was found on the bottom of the tank once the oil was drained. A reservoir that is not cleaned can act as an incubator instead of dissipating the heat in the oil. Many reservoirs contain a suction strainer. This strainer is located under the oil level and is often out of sight and out of mind. It should be removed from the reservoir at least once a year and cleaned by blowing air from the inside out. The strainer should also not be overlooked when troubleshooting. If the strainer plugs up, cavitation of the pump will occur. One plywood plant changed five pumps on its debarker hydraulic unit. It finally drained the oil out of the tank and found a shop rag wrapped around the strainer. It should be noted that some strainers have a built-in check valve that allows oil to bypass when the screen is contaminated. This is even more of a reason to clean the strainer regularly, because when in bypass, dirty oil will flow into the pump. Another common problem is adding unfiltered oil to the system. This should never be done. The oil that leaves the refinery might be clean, but by the time it is stored in transfer trucks and drums, it may only meet a 50-micron standard when added to the tank. Many systems have connections for attaching the fill pump hose so the oil in the drum is ported through the system filter before it enters the reservoir. A standalone filter cart can also be used when refilling the tank to remove contaminants. 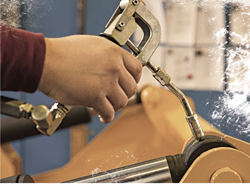 When a hydraulic problem occurs, usually one component has failed. It is essential to match the part numbers between the new and old components. Hydraulic pumps and valves that look alike are not necessarily the same. Each number or letter in the part number indicates a feature about the pump or valve. If one letter or number is different, the manufacturer’s literature should be consulted to identify the difference. 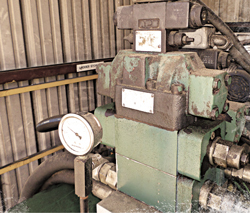 A few years ago, a plant had the main directional valve fail on its tilt hoist. The valve had the following part number: DG5S8-2C-T-50. A local vendor was called who said he had a valve with the same spool configuration and mounting pattern in his central distribution center. The valve with the following part number was flown in and delivered to the plant the next day: DG5S8-2C-E-T-50. a failed main directional valve. When the valve was installed, the tilt hoist cylinders still would not extend and retract. The manufacturer of the valve was then called and given the two different numbers. The original valve (with the letter “E” omitted from the part number) was an internally hydraulically piloted and drained valve. The valve sent by the vendor was an externally piloted and internally drained valve. Since there was no external pilot line connected in the system, the new valve would not work. To solve the problem, the valve manufacturer told the mechanic at the plant to remove the internal plug in the “P” port and install it in the “X” port. Once this was done, the tilt hoist operated normally but only after 18 hours of downtime. These common mistakes are made primarily because of a lack of knowledge. When a machine is down, the supervisor, mechanic or electrician is going to do whatever is necessary to get the machine back online in the shortest amount of time. 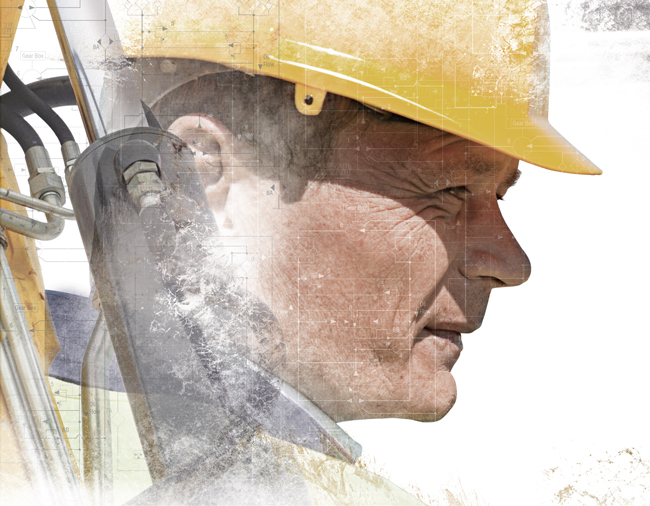 By making sure these top five errors don’t occur at your plant, you can reduce downtime, help your plant operate safely and improve hydraulic troubleshooting.